Starry Nights Condo is a viewtiful ALL NEWLY RENOVATED condo that borders the National Park that you will want to return to again and again. You have found one of the Best Values in Gatlinburg high above the city up on the ridge of the top of the mountain where it is a haven of tranquility and wildlife!! Yet only 10 minutes from downtown Gatlinburg! Starry Nights is located on the 3rd floor, no elevator. We have truly added the little touches along with the beautiful furnishings that will transport you from the hustle and bustle to a place where you can refresh and renew. The High Chalet complex is located 3.5 miles from traffic light #10 in Gatlinburg, an 8-10 min drive to the top of the mountain. High Chalet is approximately 2500ft. above sea level and is the highest complex in Tennessee thus generating spectacular views and lots of fresh mountain air! Area Attractions: You may want to take in some of the attractions of Pigeon Forge like Dollywood Theme Park, The Dixie Stampede, the new Titanic exhibit, comedy theaters, magic shows, dinner theaters, go karts, or you may like to stroll the arts and crafts communities and the streets of Gatlinburg and feel the 'Romance of Gatlinburg.' There is whitewater rafting, ziplines, Ober Gatlinburg Tram and Ski Resort, The Aquarium, Space Needle, horseback riding, hiking, fishing, museums, caves, wineries, art galleries, year around ice skating, golf courses, wedding chapels, outlet shopping (Five Oaks, Tangier, Red Roof) and so much more. And if you want to try your luck at a little gambling the new Harrah's Cherokee Casino in North Carolina is a short drive away. And there are so many fine dining and casual dining establishments it will be hard to choose! So come relax in the mountains and enjoy the peace, quiet and tranquility that 'Starry Nights' offers!!! Fresh mountain air and wildlife viewing are a definite bonus!!! CANCELLATIONS: A sixty day notice is required for cancellation and a complete refund will be issued minus a $125.00 cancellation fee. My name is Patti Smith and Starry Nights is owned by my friends who live in sunny Florida and I manage rentals for this beautiful condo for them! Isn't it gorgeous? 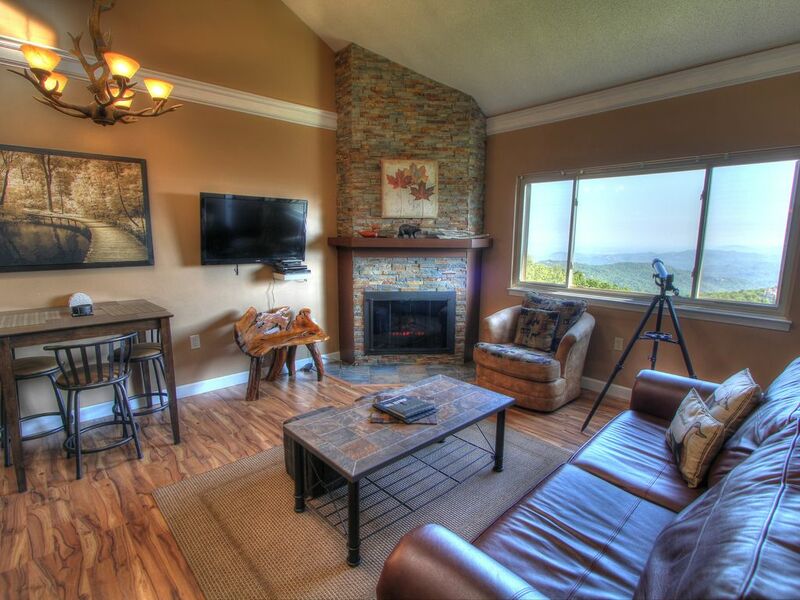 This property sits atop Ski Mountain in Gatlinburg, about an 8-10 min drive to downtown. The views are spectacular and the wildlife viewing is what we can't get enough of!!! We hope you enjoy making many memories here with your family like we do!! If you are looking for some mountain tranquility and peacefulness after the active hustle and bustle in town you will find it here in very plush, comfy surroundings. The drive up Ski Mountain is so gorgeous and picturesque there is always something new to see. Both bathrooms all newly updated with tile floors and tile surround shower and tub. Can see Gatlinburg from the balcony and living room window!! Community Laundry room located on the 2nd floor. We spent 3 cozy, comfortable nights in the Starry Nights Condo! The view from every window was amazing. The condo was very clean and comfortable with everything you need to have a relaxing stay high in the Smoky Mountains. It was also very affordable! We enjoyed family time in the hot tubs and reck room. I would recommend this place to anyone who wants to get away for a mountain adventure. Must stay! You will love it! Hate we had to leave early. The view was stunning. The condo was beautifully decorated. The beds were very comfortable and there was plenty of space for our girls weekend. The kitchen was fully stocked and had everything we need to fix our meals. I was nervous about the drive up after reading the reviews but it was not bad at all. Just follow the directions she gives. It was very foggy so we didn't get to enjoy the views but the huge window overlooking the mountains would be beautiful if it had not been so foggy. The chalet provided a Winter Wonderland for our whole family!!!!!! The chalet was both beautiful and comfortable. The scenic view from the living room window was breath-taking; the chalet was warm and cozy even though the outside temperatures were very cold; our two young granddaughters loved playing in the snow covered yard around the chalet and playing in the warm and toasty game room. The kitchen was well-stocked with everything that we needed for our meals and the bedding was extremely comfortable. We could not had a more pleasant vacation. Beautiful views, great vacation rental! The views were beautiful and the condo was nice and comfortable, with a well equipped kitchen for family breakfast, the drive up was not my favorite, many sharp turns and areas with no rails along the road, steep hills but the view is incredible from the condos balcony and large windows in the living room. Would definitely recommend and even book again! Thank you for an enjoyable experience at Starry night condo! The High Chalet complex is located in beautiful Chalet Village in Gatlinburg. It is a 10 minute drive from traffic light #10 in downtown Gatlinburg. Just minutes away from Ober Gatlinburg Ski Resort, action packed Pigeon Forge and Dollywood Theme Park. CANCELLATIONS: A sixty day notice is required for cancellation and a complete refund will be issued minus a $125.00 cancellation fee. Cancellations or changes that result in a shortened stay that are made less than 60 days notice of the arrival date forfeit the full rental fee. To protect your vacation investment you must purchase Travel Insurance. Therefore, we strongly recommend that you purchase Travel Insurance for your protection which can be purchased online at HomeAway/VRBO. Cancellation or early departure does not warrant any refund of rental fee without Travel Insurance. Please read this carefully. By making a reservation and/or staying at Starry Nights, you are agreeing to these conditions. Your booking legally binds you to acceptance and adherence of the policies listed below. The property will be ready for occupancy at 3:00PM local time on the beginning date of the lease and must be vacated between 10:00 AM local time on the ending date of the lease. If you have not left the condo when our manager and housekeeping staff arrives, you will be charged a fee of $50.00. If your late check out prevents the next guest from checking in, then you will be charged an additional night. Please be on time. During high season, some units may not be ready by 4 p.m., your patience is appreciated. The PREMISES is located at: 1380 Ski View Drive,Building 5- Unit #5303, Gatlinburg, TN 37738. This is the 3rd (top) floor unit, no elevators, and is not handicap accessible. This is located at the top of Ski Mountain, 3.5 miles from traffic light#10 in Gatlinburg, about an 8-10 min drive. Elevation approx 3500 ft.